I love the taste of Lemon. 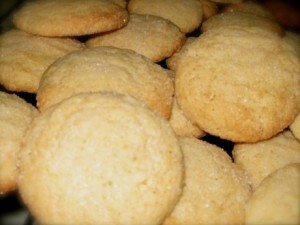 These cookies are far simpler to make than Lemon Meringue Pie and you still get that zesty Lemon flavour. I found this recipe in my trusty old Company’s Coming Cookie Cookbook, page 136. Good thing I know the basics of cookie-making because the page with the directions is long gone. In mixing bowl cream together butter, sugar and brown sugar. Add egg, lemon rind, lemon juice and continue beating for 2 minutes. Using a small Pampered Chef #2 scoop, scoop out cookie dough, roll between your hands to form a ball; roll in sugar. Place 2″ apart on cookie sheet. Bake in preheated oven for 6 – 8 minutes. Remove from oven, allow to set on cookie sheet for a few minutes before transferring to wire rack to cool completely. In mixing bowl, cream butter and sugar together. Beat in egg, vanilla and cocoa. Turn out onto a lightly floured surface and shape into rolls, 2 inches in diameter. Wrap in waxed paper or cling wrap. Chill overnight, or longer; may also be frozen. *If you are in a super hurry to make these, wrap and place in freezer for 30 – 40 minutes. To bake, preheat oven to 375F. Slice thinly and place on a parchment paper lined cookie sheet. Bake in preheated oven for 5 – 8 minutes. Let set on cookie sheet for 2 minutes before transferring to wire rack to cool completely. Add icing sugar in 3 additions, stirring well after each addition. Stir in vanilla and 1 Tablespoon of milk; increase mixer speed and beat well. Add a lil more milk, 1 teaspoon at a time, beating well after each addition until you get the consistency you are looking for. 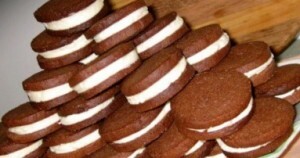 To construct each cookie, pipe a dollop of Buttercream filling onto half of the cookies, top side facing down. Top with a second cookie, top side up and apply a lil pressure to squish cookie down onto the filling but not allowing the filling to ooze over the sides of the cookie.